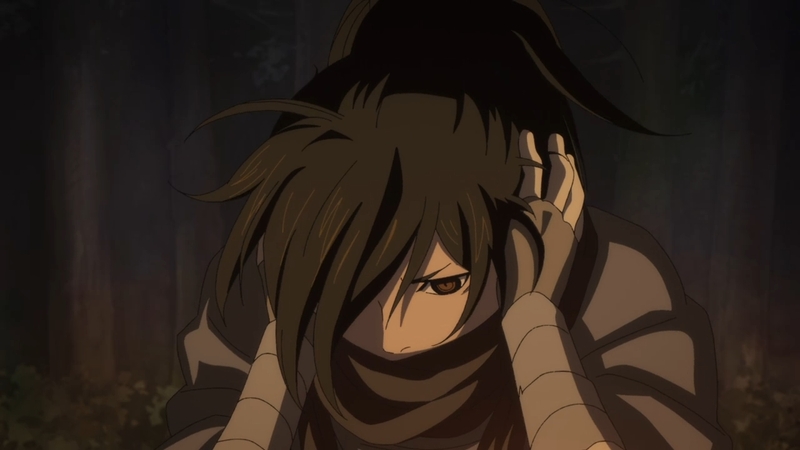 At the moment, Hyakkimaru’s newfound sense of hearing is more of a burden than a boon. His mind isn’t used to filtering out unnecessary noises, so a dead quiet forest ends up sounding like an endless cacophony. I’m sure he feels as though he’s going crazy. Plus, being able to ignore our senses is something that we take for granted. I live next to a busy road, but the sound of cars driving by doesn’t bother me one bit. I won’t notice it unless I force myself to listen. For someone like Hyakkimaru, he would probably suffer from insomnia if he had to live where I live. Hell, I wonder if it’s even realistic for our hero to be able to adapt to his situation. If your brain doesn’t learn to process sensory information at a young age, can it still do so later in life? I have no clue, honestly. But I digress. 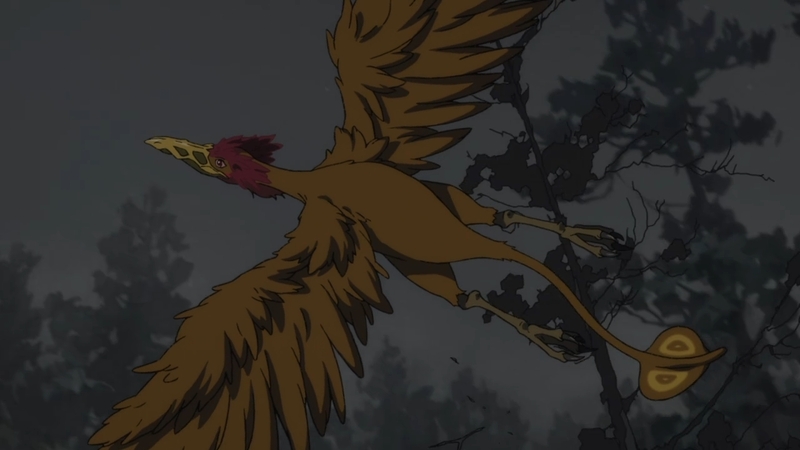 What happens next is that Hyakkimaru nearly falls prey to a bird monster had the old man not come by. But when he wakes up in the morning, he is entranced by the singing of a young woman bathing in a nearby stream. So we come to know Mio, and her song is probably the first pleasant sound to grace Hyakkimaru’s ears. Not only that, she cares for quite a few unfortunate orphans. Like our hero, some of them are even missing limbs. It’s almost as if Mio has been put on this earth (or written into this story) to be Hyakkimaru’s ideal woman. She’s the self-sacrificing, motherly figure that he has been deprived of all his life. 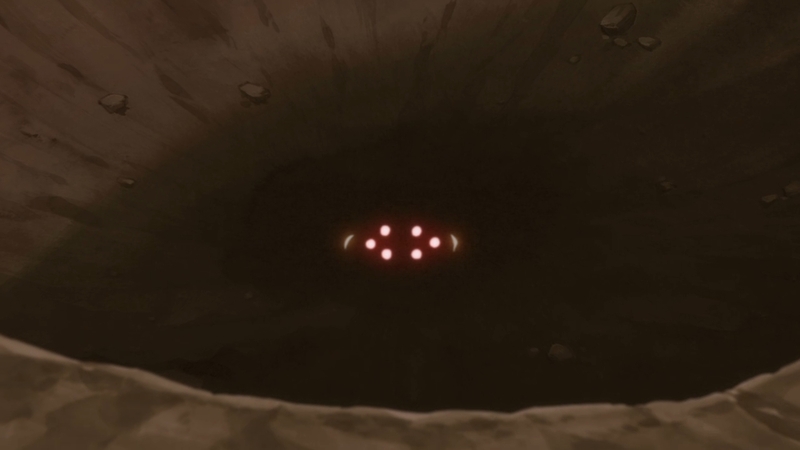 In a tragic story like Dororo, this can only mean one thing: poor Mio likely won’t survive this two-part story. How on earth does a young girl manage to care for all those orphans all by her lonesome? Where does she get the money? Well, it’s obvious that she’s prostituting herself. First, the woman has to sleep during the day. We are told by one of the orphans that she goes to “serve” one of the armies at night. 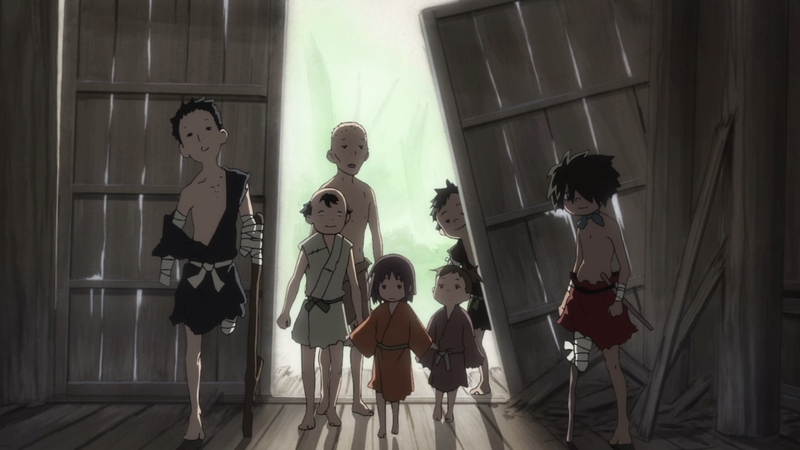 Dororo is too young and innocent to understand what this entails — and this is probably true of the orphans as well — but we know better. 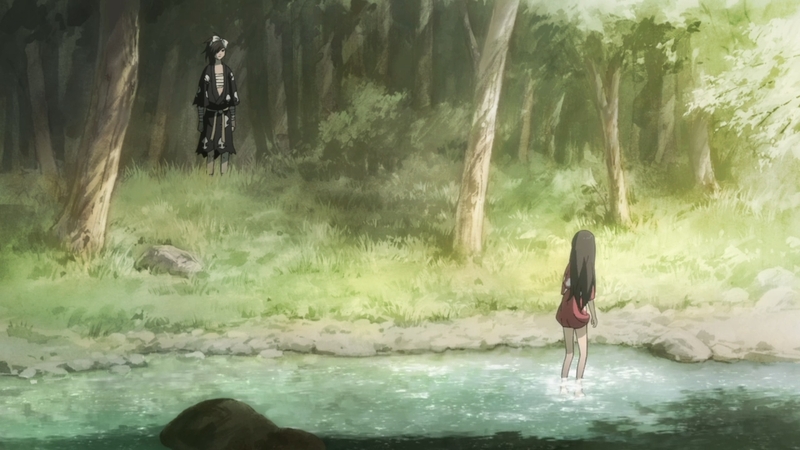 And whenever Hyakkimaru gazes at her, Mio is uncomfortable because she feels as though he can see deep into her soul. 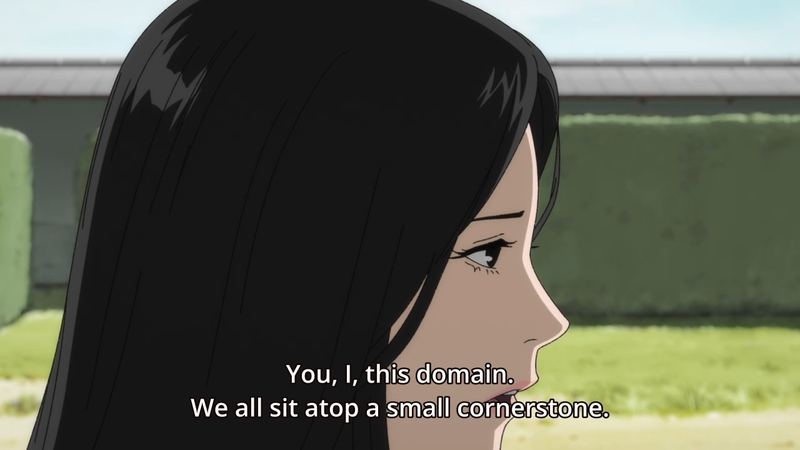 Dororo tells her that his partner can see the color of people’s souls, but this explanation offers the woman no solace. Instead, she just looks down in shame and covers herself up. Due to her profession, she must feel a profound sense of self-loathing. Her love for the children is probably the only thing that keeps her going. As a result, she pushes herself to her limits for their sake. 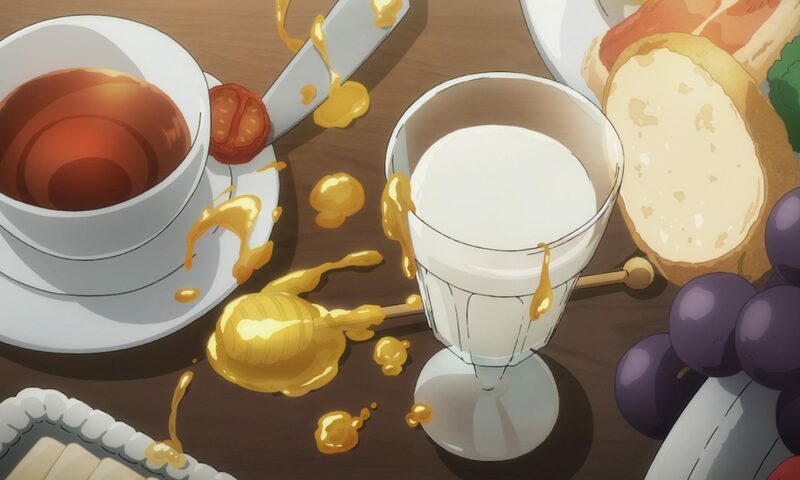 When the old man tells them that there’s a potential safe place for all of them to live, Mio decides to work even harder; instead of just “serving” one of the armies, she’ll work both sides. 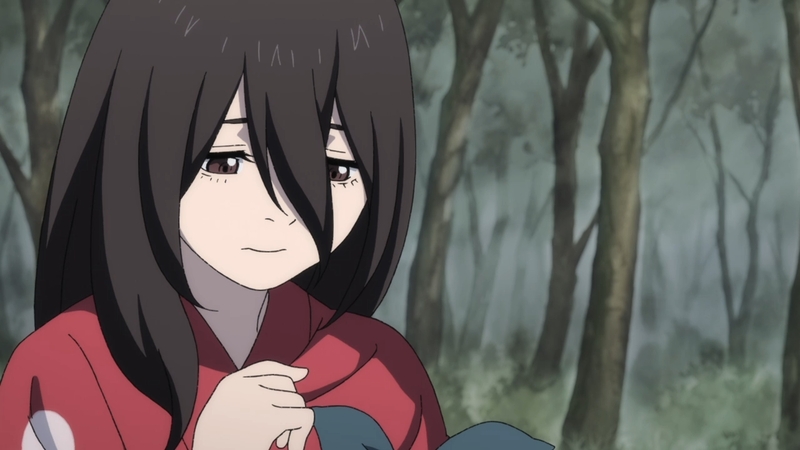 A clueless Dororo tells one of the orphans that he’ll follow her and make her quit if “things get too tough.” Well, the kid ends up learning more than he bargained for. I’m already dreading next week’s episode. It’s almost as if Mio’s sole purpose in life (and this story) is to suffer. Her love for the orphans is certainly beautiful, and there’s always something positive to glean from even a tragic story. Nevertheless, her eventual fate is going to be a gut punch that ruins my day. It’s inevitable. 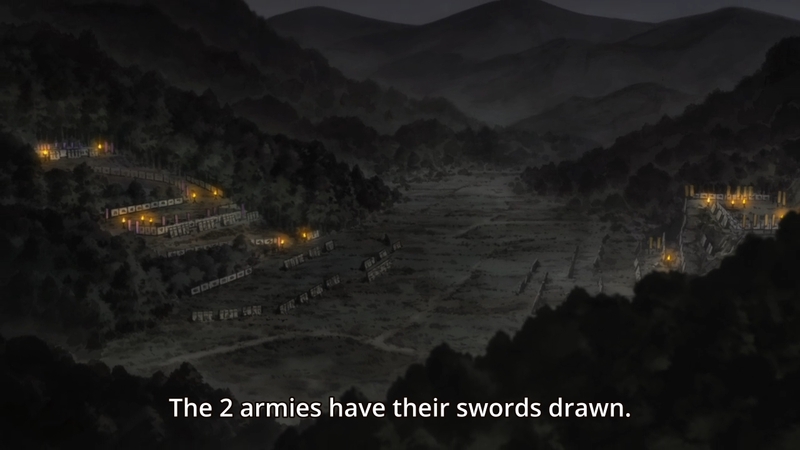 I feel as though I can already tell what’s going to happen next: samurais are going to find out about Mio “serving” both sides, and they’re going to retaliate. 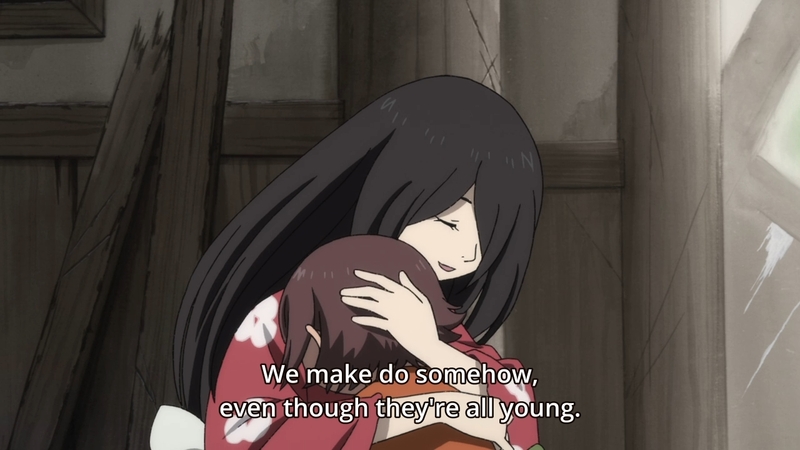 Maybe Hyakkimaru, Dororo, and the old man can protect her and the children, but I doubt it. I really, really doubt it. It’s typical in these stories for unfortunate souls like Mio to meet their end as a way to add depth and pathos to the main character’s motivations. Plus, much like her, Hyakkimaru also ends up pushing himself too hard. The old man may have found a potential safe place for Mio and the orphans, but (of course) there is a demon inhabiting the place. Our hero hasn’t quite recovered from his wounds, but he still unwisely decides to fight it. We are told that war is about to break out any day now, so maybe that’s why everyone’s in a rush. 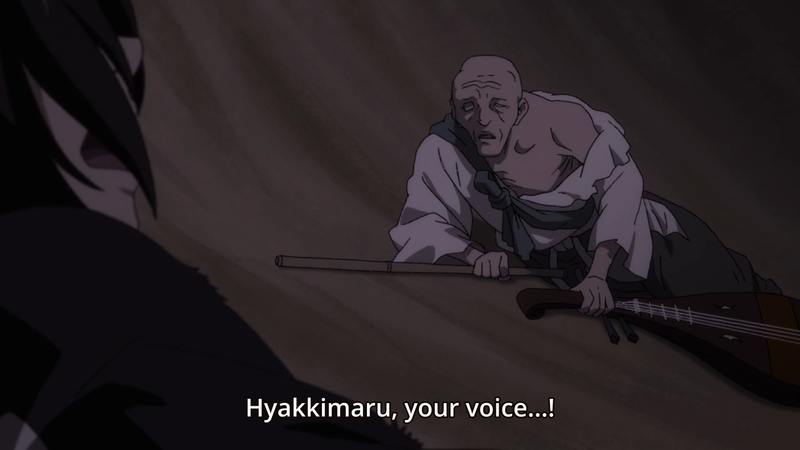 In the end, he manages to pull through with the old man’s help — and hell, he even gets his voice back — but I doubt Hyakkimaru will be able to fight with one of his leg in this condition. Anyways, there are perhaps dire consequences to Hyakkimaru getting his body parts back. 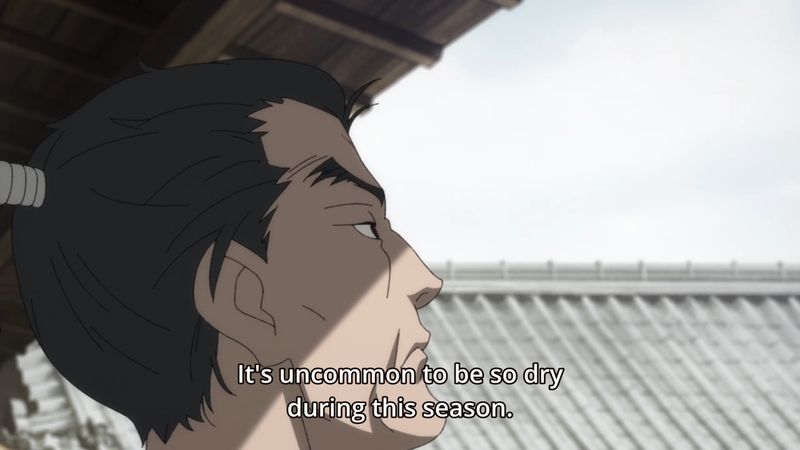 There’s a short scene involving Lord Kagemitsu where we learn that drought and famine are back. According to his wife (i.e. Hyakkimaru’s mother), they even suffered a landslide earlier this year. Maybe it’s just bad luck. Or maybe the demons’ boon is waning as they die one-by-one. So is it Hyakkimaru’s (inadvertent) fault that people are suffering? Nah. In our day and age, if a certain region doesn’t get enough rainfall, we force the issue. We grab water from some place else and transport it to us. Obviously, this isn’t possible back then. Maybe Kagemitsu and his people just aren’t meant to live here. Or maybe they should just use their human ingenuity and indomitable spirit to find a solution. What’s clear is that quick-fix solutions do not work. Hyakkimaru trying to slay a demon before his wounds have healed up might mean that he can’t fight effectively in the near future. Mio trying to earn more money right this instance might mean that she overworks herself to death. Or even worse, the samurais will lash out at her and the children. Finally, Kagemitsu tried to trade the life of his first-born son for success, and now his house of cards is threatening to collapse on him. liked the episode and you could tell early on what mio was up to.